There are many good reasons why you might be planning to have a crew come out to do some concrete cutting on your property. There are many good reasons why you might be planning to have a crew come out to do some concrete cutting on your property. Perhaps you need to cut off part of a slab, or maybe cut a hole in a wall for a window. Whatever the reason, here are some steps you should take care of before the fact so that your property is ready for the work they have to do. In preparation for the concrete cutting, remove all of your items from the area. Once the concrete cutting begins, there will be a lot of dust and debris, so you don’t want any of your personal belongings to get covered with dust and possibly damaged. This goes for indoor or outdoor cutting areas. If you have items that are too large to move or are permanently attached to surfaces in the area, make sure that they are well covered to protect them from dust. For any items that you do leave in the room or work area, make sure they are well out of the direct work zone so that the workers have space to move and maneuver their equipment safely. There is no way to eliminate 100% of the dust during the cutting process, even with saws that have attached vacuums, especially in confined spaces. 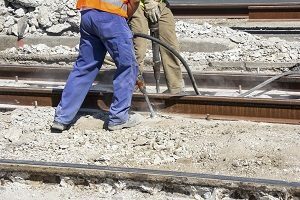 The dust from concrete cutting is incredibly fine, and it gets everywhere – even floating into areas where the cutting is not taking place. Before the cutting begins, close the doors and hang plastic sheets that can be taped down once the workers and equipment are in the room, to limit the amount of dust that gets out. You should also consider covering the floors with dropcloths if the flooring material is carpet or has gaps (like between floorboards) where the dust can get trapped. Finally, shut down your HVAC system and cover the vents to keep the system from spreading the dust everywhere on your property. Dust concerns are less of an issue for outdoor areas (though concrete cutting still requires safety equipment like masks) than indoor areas. However, you will want to make sure that the work area is clear for the workers to access it. Verify any plants or shrubs are pruned back away from the work zone. If there are landscape features, like a pond, that could be damaged by the concrete dust, make sure to cover them before the work starts. This entry was posted on Friday, December 7th, 2018	at 11:16 am	. Both comments and pings are currently closed.